Up a flight of stairs to a bedroom with a luxurious king-sized bed with co-ordinating quality bed linen, feature wall and fabrics. Antique pine dressing table and mirror, chest of drawers, a fitted wardrobe set in an alcove and 2 bedside chests with lamps. Sheep-skin floor rugs and a wall mounted slimline Sky TV.The bedroom has 2 Velux windows with black-out blinds, one to the east with views as far reaching as the Black Mountains and the other to the west side overlooking the well established wildlife lake and the peaks of the majestic Brecon Beacons. 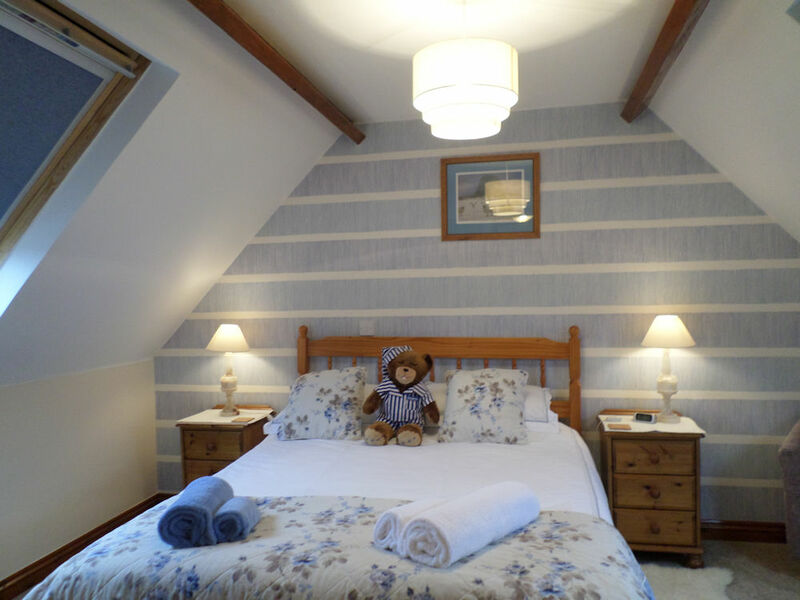 Egyptian cotton bed linen, pillows and duvets are provided plus additional Welsh woollen blankets for winter if required to ensure a good night’s sleep.